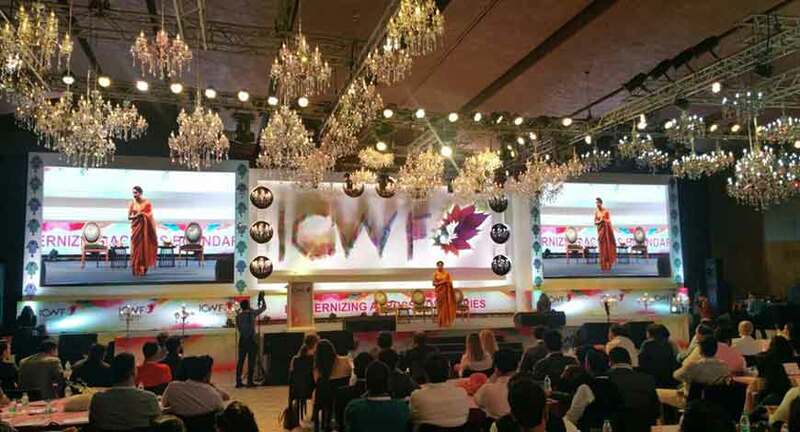 The International Convention for Wedding Fraternity (ICWF) dropped the curtain on its 5th edition yesterday with a two-day conference and exhibition concluding with the Global Indian Wedding Awards (GIWA). Aimed at the wedding industry and its varied stakeholders the event took place at the recently launched Hyatt Andaz in Aerocity, New Delhi from 21- 23 July 2017 and was hosted by leading event emcee Gitikka Ganju Dhar. 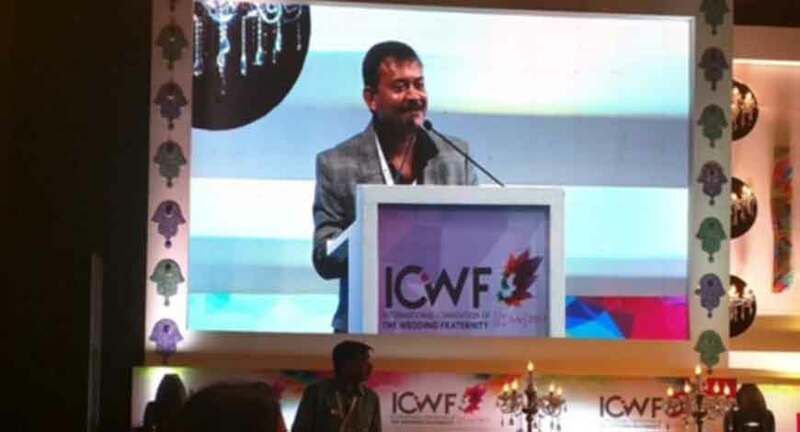 ICWF is the brainchild of 5 Guys Project, an alliance between five leading event companies who set out to homogenize the fragmented wedding industry in India through a platform that connects its various stakeholders including wedding planners, creative partners, service providers, venues and entertainers. President of the Event and Entertainment Management Association, founder of Wizcraft and an event industry pioneer, Sabbas Joseph did the honors to introduce the event with a rousing speech. He also announced the launch of EEMA SAFE, an initiative to encourage safety and security best practices at live events, which was followed by a collective pledge by the full house of event planners to follow standard safety practices at their events. The conference showcased some awe-inspiring work in the field of private social events by international experts like Colin Cowie who boasts of a glitzy clientele including Oprah Winfrey, Mary J Blige and Ryan Seacrest; Benny Avisar of Israel based Sky Productions who established through his presentation that the sky is no longer the limit; Tom Wolfe who has pioneered the fusion of food with art and product design; and Belgium based floral designer Tomas de Bruyne- a master of floral décor in event design. Not ones to be left behind, Indian wedding planners including pricipal convener of ICWF Samit Garg of E Factor Entertainment, Vijay Arora of Touchwood Events, Rajiv Jain of Rashi Entertainment and Ankita Chugh of Ankita Chugh weddings put their own spin on the subject by decoding the big fat Indian wedding, its trends and future. The exhibition showcased trends in wedding decor, services, chic accents and other luxury solutions pertaining to private social events. Union Minister Vijay Goel graced the occasion on 23 July in support of the events industry and was received by Sabbas Joseph and Rajeev Jain, president and treasurer of EEMA, respectively. Among other things, Goel committed easier access to state owned land and heritage sites for hosting events. Several event planners exclaimed that their previous attempts have been met with hostile pushbacks, in response to which he vehemently established that all future requests would be entertained via his office and he would personally ensure optimal usage of state-owned property for the purpose of events- a bold yet promising statement. After two days of rigorous knowledge sessions interspersed with malt tasting sessions and entertainment, the event came to a close with the Global Indian Wedding Awards. With close to 500 aspirants in attendance, awards were given away in various categories including Best Destination Wedding, Best Venue for a Wedding; Best Wedding Photographer; Best Wedding Invitation, and suchlike. Entertainment ensued with soulful singer Vipin Aneja, and a mind blowing 20-piece band Thaikkudam Bridge featuring members from multiple Indian states who sang in their regional dialects. The artists displayed their vocal prowess with full fervour to woo potential clients in audience. The next edition of ICWF is scheduled for 27- 29 July 2018 at Hotel Fairmont in Jaipur. The Europe chapter of the event will debut on 2- 5 June 2018 at Ciragan Palace Kempinski in Istanbul.